A soup that will bring you good luck. 1. In a large saucepan, fry bacon and onion for 2-3 minutes. 2. Drain off excess fat, return to heat and stir in garlic and jalapeño, cooking for for 2-3 minutes (stirring constantly to avoid burning garlic). 3. Add broth, pimentos and black eye peas; simmer on extra low heat for 10 minutes. 4. Remove from heat and stir in hot sauce. 5. 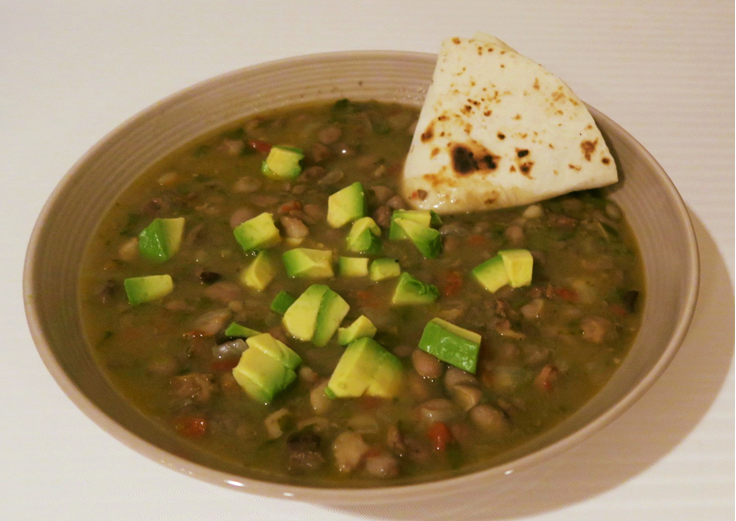 Divide between warmed bowls and top with diced avocado. 6. Best served hot with tortillas.